The other day I came across my stash of roasted red peppers in the freezer again and since then I could not get them off of my mind; I just had to pull some of them out and do something with them! When red peppers are roasted they become nice and sweet and one of my favourite things to pair them with is a salty feta which helps to balance out their sweetness. I already had an idea on how I wanted to use that roasted red pepper and feta combo and that was in the form of some crispy fried fritters. At their base fritters consist of some kind of body, in this case the roasted red peppers and feta, an egg and some flour or bread crumbs to hold everything together. From there you can mix in any other flavours that you want and I went with some oregano and a splash of balsamic vinegar as they also both go well with roasted red peppers. The fritters are then finished off by spooning the batter into a pan to fry in oil until golden brown and crispy on both sides. This is certainly another winning way to enjoy that roasted red pepper and feta flavour combination! In fact they are so addictive that I have already made them a few times! Although they are great just the way they are, they are even better with a balsamic vinaigrette for dipping or drizzled with a balsamic syrup. Mix the roasted red peppers, parsley, oregano, onions, feta, egg, balsamic vinegar, salt and pepper in a bowl. Mix in the flour adding more if needed in order to ensure that the fritters will hold together. Spoon the mixture into the pan and cook until golden brown on both sides, about 2-4 minutes per side. Superb Feta Fritters……..very ravishing…..just couldn't stop commenting…..lovely color…. Ahhhhh I LOVE fritters! Can't wait to try this and the rest of your fritter creations. Am new to your blog and love what I have tried so far! 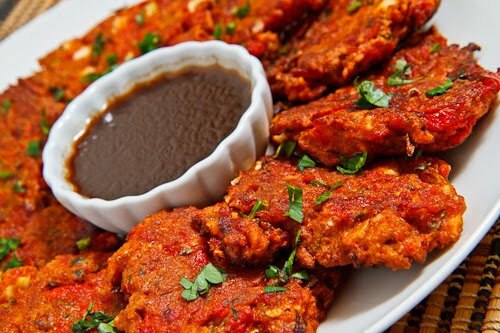 These fritters look amazing! I'm totally over corn in fritters, so this is a welcome change! 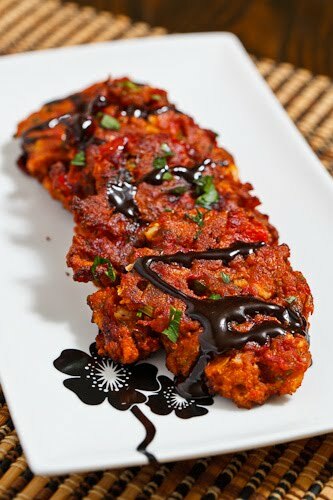 Splendid fritters! They must be scrumptious. These are so inventive Kevin! Never seen anything like them! But they sound delicious. These look awesome! I love the feta addition. Mmm. this sounds sooo flavorful and I love the fiery red color! I am not sure how the food would taste, I am sure great but the plate you have it on is gorgeous!!!! Feta and red peppers are such a lovely combination, but then to fry it … well, you just made it so much better! Looks fantastic! I have about ten roasted red peppers left in my freezer. It's time. This will please all. These look fantastic! Such a great idea. That's so innovative. It is like zucchini fritters but with roasted peppers. I bookmark the recipe. It looks indian! What a great way to eat veges as well. I got to remember to add feta next time in my fritters. These look fabulous! Next time red peppers are on sale, I'm buying a ton and roasting them. And then making these for my next party as little appetizers! These sound fantastic. I love the balsamic! These were good. I love everything in them. I've loved everything i've tried so far. I'm a huge fan of yours. I made these tonight. Fantastic! Thank you for sharing your recipes! I made these today and they were delicious!!! Great recipe, and so different 🙂 To other people trying these, note to make them about the same size as in Kevin's picture because I got lazy at the end and made some bigger ones and they didn't cook all the way through. Oops! I love unique fritter recipes. These look fantastic, some of my favorite flavors. I thought frying makes food unhealthy? Nikki McInnes: These work well baked if you would prefer to keep the calories down.